Although the west side of the City of Waterloo is quite urbanized, there are a variety of trails. 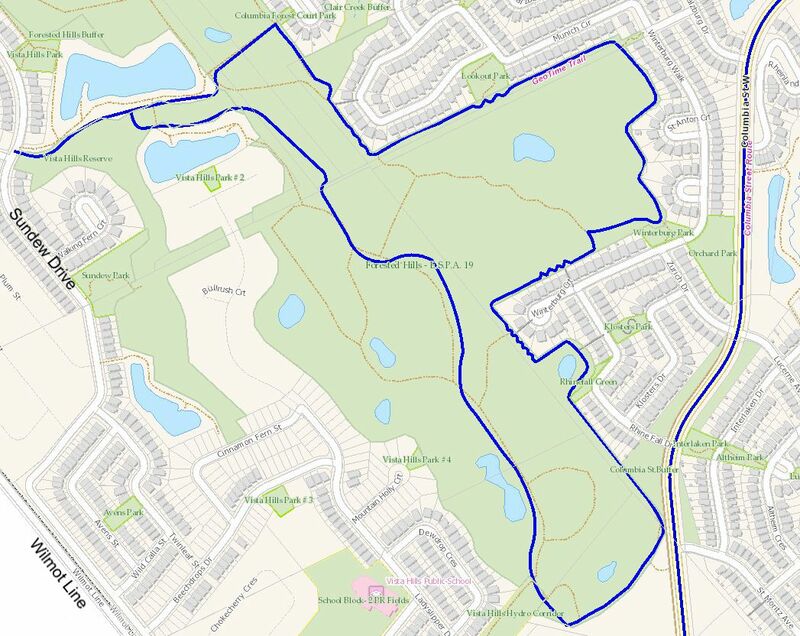 The GeoTime Trail is a relatively short loop (less than 5 km), educational and located between Erbsville Road and Wilmot Line. It is one that may appeal to individuals and families. 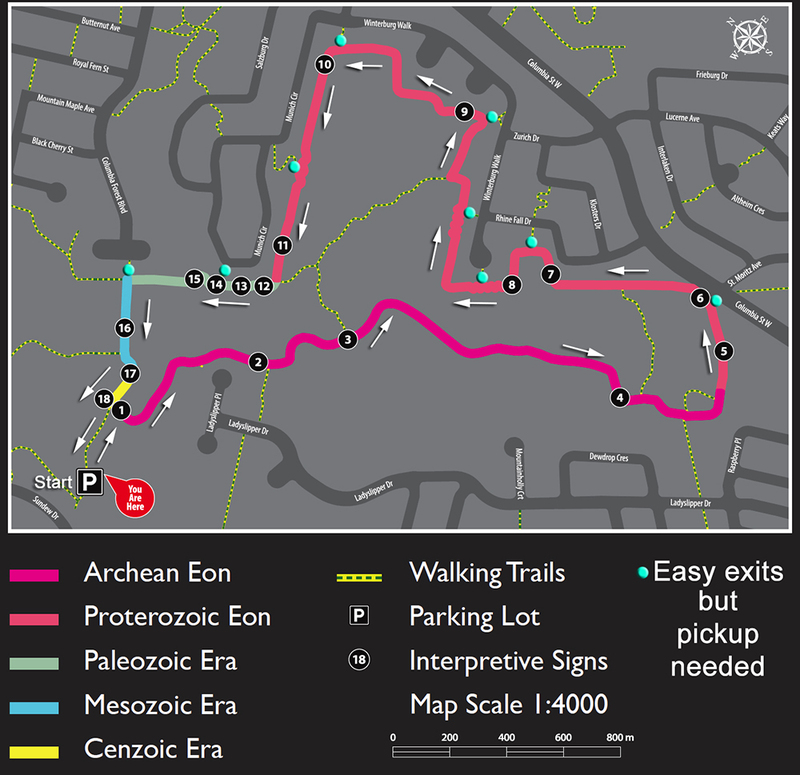 The GeoTime Trail exists thanks to work performed by the City of Waterloo and Dr. Alan V. Morgan, Professor Emeritus, Quaternary Geology and Paleontology, University of Waterloo. The area is part of the Waterloo Moraine and contains the Forested Hills - E.S.P.A. 19 (the largest contiguous forest in the City of Waterloo). ESPA stands for Environmentally Sensitive Policy Areas. There are other trails in the wooded area. 1) City of Waterloo in-house city map and 2) Google Maps. The official web page is located in the City of Waterloo beta website here (posted 2019JAN29). Below I have posted some resources that may assist you when you are planning to visit and walk the GeoTime Trail. I always try to takes groups on the same trail during the summer, fall, winter and spring. This provides lots of natural variety. For example, the spring ephemeral flowers are in bloom for a short time; an example would be "blood root". Late fall and winter walks,when most leaves have fallen from our deciduous trees, provides more views. Also, when you walk the same trail in both directions you tend to discover more. The image below is a screen capture from the City of Waterloo "GeoCortex Viewer for HTML 5" located at City of Waterloo in-house city map. To capture the image, I used a scale of 1:5,500 in order to view the whole GeoTime Trail (blue line). Note that this presentation shows the GeoTime Trail walk beginning and ending in the parking lot just off Sundew Drive (parking details appear below). The other blue line, along Columbia Street West, appears to be a bus route. The image below is a schematic map of the GeoTime Trail. Along the trail are 18 information boards spaced as various distances along the path. If you wish to follow the trail numerically starting from the Sundew Drive parking lot, you should veer right at the first major fork until you are at display board number one. From that position countinue counter clockwise. The Google Map below shows the GPS track I recorded when I walked the GeoTime Trail. It contains the approximate waypoints for each of the 18 information boards. Note that the Google Map displayed shows me starting and finishing at the Sundew Drive parking lot. The parking lot off Sundew Drive is a recent addition and I am not familiar with how well that parking lot is cleared of snow during the winter months. In winter, and if I am not leading a large group of hikers, I tend to park on Munich Circle. See parking details below. The main parking lot for the GeoTime Trail is the one just off Sundew Drive. The entrance is at approximately 43.459419, -80.597670. This entrance (and finish) takes you in to information board number 1 (number 18 is nearby and off to the left and is where you finish the loop). Walking counter clockwise takes you in numerical order. The distance between information boards varies. If you download the GPS track (below) and use it (GPS receiver, GPS capable smart phone, etc. ), you should not have trouble navigating the loop. If you wish to walk this trail on a nice winter day note that I am not familiar with how well the parking lot is cleared of snow.